Atlanta, Georgia (CNN) -- The heat isn't working in the house, so Brook does what he can to keep warm for his night's sleep. He wears a thick coat and about five layers underneath, with a hat covering the hood that he draws close to his face. He covers up with a donated blanket and rests his head on a bag where he keeps his belongings. The heat isn't working because he's not paying the bills. In fact, it's not his house -- it's abandoned, and he's not supposed to be there. Brook, a 42-year-old homeless Atlanta man, is describing one of what he calls his many "catholes" -- places he's found to sleep and that provide some refuge from the elements. Standing on a central Atlanta sidewalk on an unusually bone-chilling Southern night on Tuesday, he says homeless shelters generally aren't for him. He doesn't trust the men who stay there, and he thinks he's better off alone. "It's an environment where you can't keep your eyes closed," says Brook, who declined to give his full name and says he's seen too many men stealing from others in shelters. Brook is among the thousands of Atlanta-area homeless choosing where to keep warm this week as a cold snap blisters much of the nation, including Southern states not used to an extended period of freezing temperatures. Sherman Vickers, 63, prefers sleeping in parks on a foam mat but takes advantage of shelter when it gets too cold. The Shepherd's Inn in Atlanta made room for more homeless men this week as temperatures and wind chills dropped. Sherman Vickers, 63, also prefers to sleep on his own, usually using shelters and other homeless services only for meals and showers. On fair-weather days, he sleeps in parks, resting on a mat of inch-thick foam that he rolls up after using it. But on Tuesday, a night when temperatures were in the 20s and wind chills were worse, Vickers was gratefully resting at The Shepherd's Inn, an emergency men's shelter run by Atlanta Union Mission, a Christian ministry. "This time of year, you need to be somewhere out of the cold," Vickers, a homeless Atlanta resident, said Tuesday at the shelter. This week, with morning temperatures in the teens, more people have flocked to The Shepherd's Inn than usual. The shelter, which normally takes in about 250 men nightly, took in more than 400 on Monday night, with cots and mats put in the kitchen and cafeteria to help with the increase, Atlanta Union Mission CEO Jim Reese said. An AUM shelter for women and children also saw an increase. Though the cold weather strains resources at the emergency shelters, Reese said he sees the influx as an opportunity for the staff to invite more people into its life-skills and other programs, which provides reserved beds at other buildings. "I think what we would see is that might break a habit of being comfortable [sleeping] under a bridge," Reese said. "And maybe this environment ... gives them a chance to see it really is different." More than 21,000 people in Atlanta and Fulton and DeKalb counties were projected to be homeless sometime last year, according to the Metro Atlanta Tri-Jurisdictional Collaborative, a group that addresses homelessness in the area. Even this far south, the weather can be cold enough to kill. 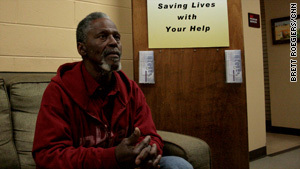 In February 2008, four apparently homeless people were found dead on one day in Atlanta, and authorities suspected below-freezing temperatures were a factor, the Atlanta Journal-Constitution reported then. In Fulton County, which includes part of Atlanta, two homeless people in 2006 and one in 2007 died of hypothermia, according to the county medical examiner's office. Though shelters expand their capacity and other groups such as churches may offer makeshift refuge in extremely cold weather, not every homeless person who'd want to stay at a shelter can. 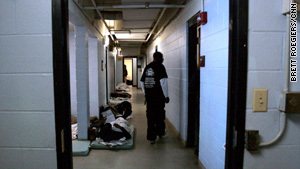 In 2007, the U.S. Conference of Mayors reported that 12 of 23 U.S. cities surveyed said they had shelters that at least sometimes had to turn people away because of a lack of capacity. Brook, who says he's been without a regular job for two years and on the streets or in jail for much of the time since he moved from New York in 2001, prefers to go it alone. He hints he breaks the law to make money for food: "I don't sell drugs, but ... I'm in what you could call creative independent marketing and distribution -- I acquire things for low and I sell high." He says he's also a barber, having acquired clippers he uses to cut people's hair at a price he says is lower than area barber shops. He says his catholes are many, from regular haunts such as certain abandoned houses and parking-garage stairwells, to those he'll improvise on the fly, such as Dumpsters that he'll line with cardboard. Where he sleeps depends on where he is, what he can find unoccupied and the weather. On a cold week like this, an abandoned house is the choice spot, though he doesn't want to always use the same one for fear he'll get caught. Each morning he departs a sleeping place, he takes his bag with him and stashes it somewhere else, trying to leave no trace where he's slept. The worst, he says, is when it's cold and raining. Two weeks ago, he said, he reluctantly went to a shelter because of rain. Fearing a theft, he didn't sleep. "You sit in a chair with a light on, so you can't really rest, but you get off your feet," Brook said. Brook says he'd prefer a place of his own and hopes to one day make and save enough to have one. But while he's homeless, he'll take his catholes over a shelter. Vickers, who says he's been homeless for much of the time since the late 1980s after he suffered a hit-and-run injury and lost his Atlanta-based trucking job, may prefer the outdoors, but he'll take no chances in the cold. He's been at The Shepherd's Inn daily since mid-December, he said. "Being here at the mission is a good thing. It's well-staffed, it's comfortable, clean, the food service is good, and they're safe," he said. "It's good being out of the cold." CNN's Lauren Prazmark contributed to this report.